Turkey Enchilada Casserole is a great way to use up all your leftover turkey after you’ve made sandwiches and everything else. It’s spicy, cheesy, and oh so good! So, how did it go? Your Thanksgiving dinner, that is. 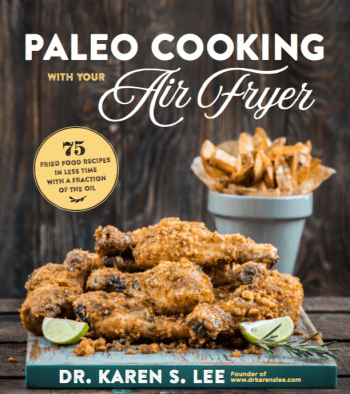 Did your guests go “Whoooo…” and “Ahhhhh…” at your fabulously delectable dishes? Did they gobble until they wobbled outta your house in Tryptophan coma? Yeah. Mine did too. But we didn’t finish all the food. Needless to say, my fridge is still full of food. But don’t worry. I have a plan. 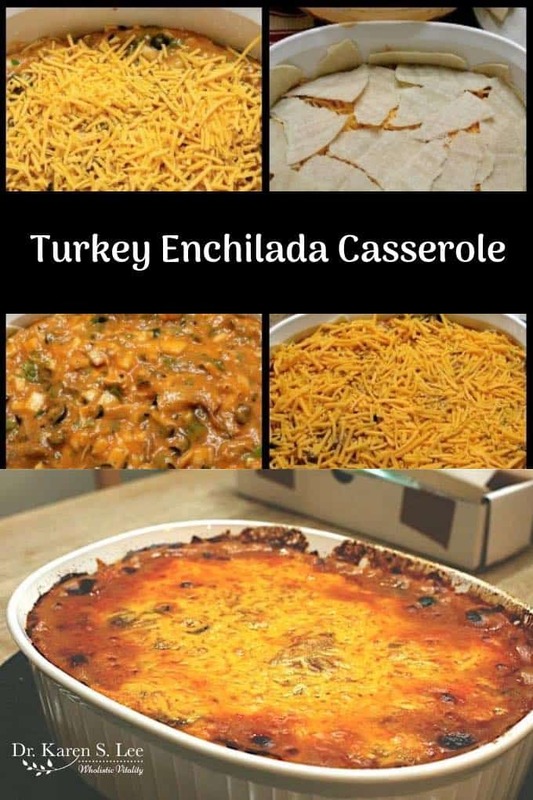 Actually, having a ton of leftover turkey is always my plan because it’s a tradition in our house to eat Turkey Enchilada Casserole the day after Thanksgiving. This casserole will undoubtedly use up all the leftover turkey without any remorse. It has a nice little spicy kick to it that it will dissolve any gastronomic guilt you’ve experienced since Thursday. What? Oh, you don’t eat turkey? You can substitute with chicken too. Got that covered! What’s great about this dish is that you can use up dry meats and bits and a piece of meat that fall into the roasting pan while cooking the turkey so every bits are used up! My point is, you’re the boss, applesauce. You do whatever you’d like to do. Also, I use canned cream of chicken in this recipe but you can use a homemade recipe for it if you have one. I don’t but after cooking all day for Thanksgiving, sometimes I just want to use an already made ingredient and cream of chicken for this recipe is one of them. I’m flexible like that at times. Don’t sue me. 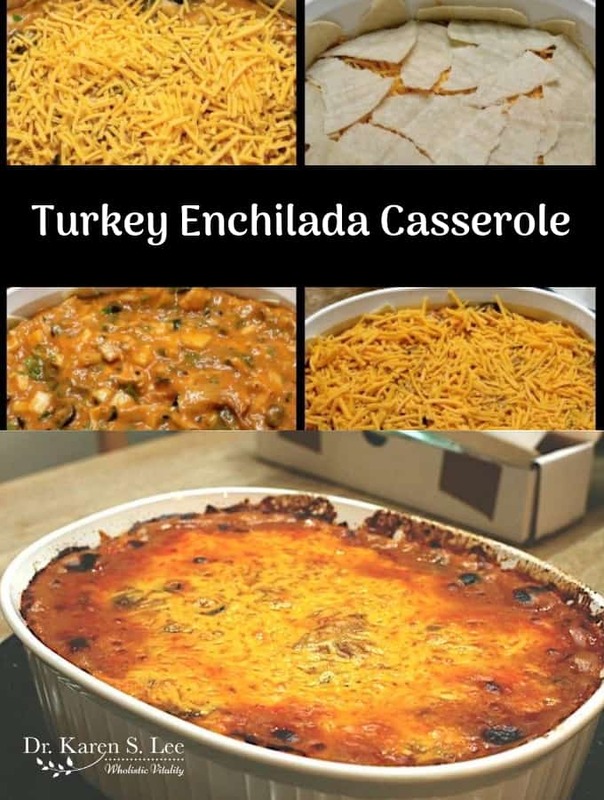 Combine Enchilada Sauce (Look below for the recipe) with turkey, onions, olives, cream of chicken soup to make the filling. Add all the ingredients and mix ’em all up in a large bowl. 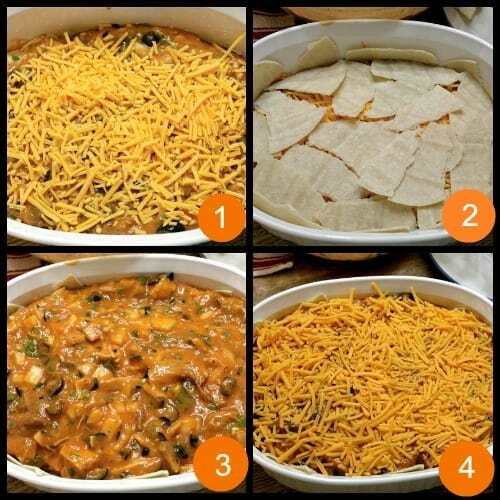 Line the casserole dish with corn tortilla strips on the bottom. You can also line the sides too if you’d like. Layer the ingredients in this order. NOTE: One little caution. Make sure to put the casserole dish on a cookie sheet to catch any drippings from the overflowing melting cheese. 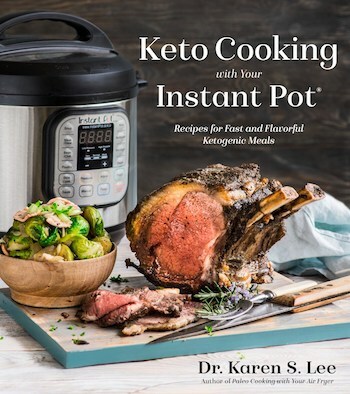 It will save your oven and prevent your smoke detector from going off. By the way, this casserole tastes sooooo much better the next day. Enjoy! Use up all the leftover turkey after Thanksgiving to make this spicy and oh so good Enchilada Casserole. Or you can make this with chicken any time of the year! 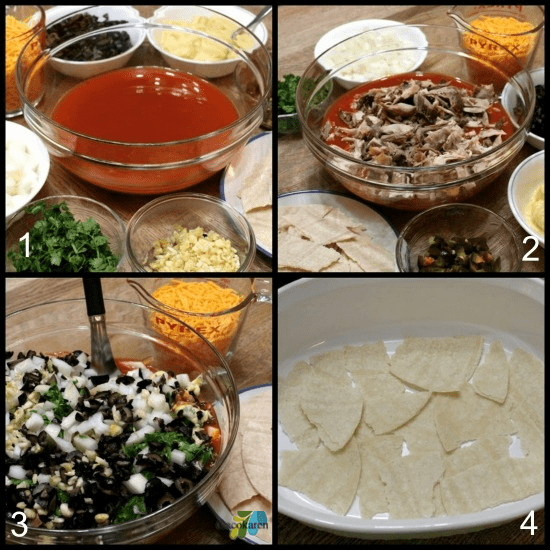 Combine Enchilada Sauce with turkey, onions, olives, cream of chicken soup to make the filling. Line the lidded casserole dish with corn tortilla strips on the bottom. You can also line the sides too if you’d like. Now layer the ingredients in this order. Cover and bake at 350 ℉ for 45 minutes. When the cheese melts and the top turn golden brown, take it out of the oven and let it sit for 15 minutes before serving. Add minced garlic and sauté for 1 more minute. Add the rest of the ingredients and bring to a gentle boil. Lower the temperature and simmer for ten minutes. Turn the heat off and cool the sauce and store in a glass jar in the refrigerator for up to one week.